Anti-gerrymandering activists outside the Supreme Court in March, before the court heard arguments on a gerrymandering case. While the Supreme Court ultimately punted on deciding whether partisan gerrymandering was legal, the issue took on a political life of its own this year. "It's an indication of how desperate legislators are to cling to power that they're willing to give the middle finger to voters in their state," said Justin Levitt, a law professor at Loyola Law School in Los Angeles who researches redistricting. In Missouri, one of the four states where voters approved ballot measures in the fall to rein in gerrymandering, Republican Gov. Mike Parson said lawmakers should repeal the state's new nonpartisan redistricting law, dubbed "Clean Missouri," arguing that it is unconstitutional. Meanwhile, North Carolina's GOP-dominated Legislature is attempting to move a major lawsuit against its redistricting plans from state court — where it's likely to lose — to federal court, which could be a friendlier venue. Earlier this year, the Supreme Court considered — and ultimately punted on — whether to outlaw the practice. Federal and state courts rejected multiple congressional maps around the country, declaring they were unfairly drawn to handicap political opponents. Pennsylvania's Supreme Court even redrew all 18 of the state's congressional districts after finding the Republican Legislature had tilted the map too far in the GOP's favor. Voters in Colorado, Michigan, Missouri and Utah approved limits on partisan redistricting via ballot questions this fall, while lawmakers in Ohio overhauled that state's process to reduce political influence over it. During Michigan's lame-duck session, lawmakers considered but did not pass a bill that would have weakened the independence of the recently approved independent redistricting commission. The focus on redistricting and gerrymandering this year is driven by the calendar. After the 2020 census, congressional seats will be reapportioned among the states, and new legislative and congressional maps will be drawn in time for the 2022 midterms. "2021 is around the corner," said Levitt. 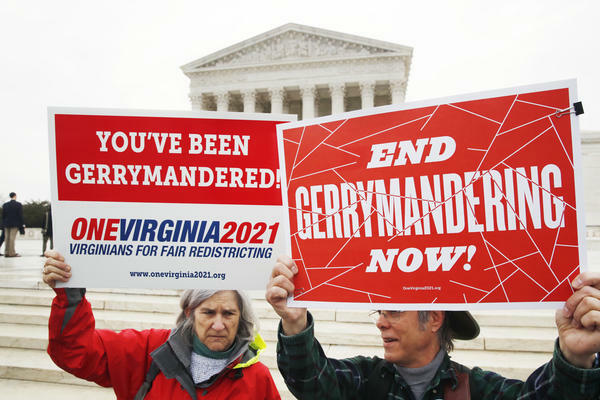 Although Democrats have benefited from gerrymanders in states they control (most notably in Maryland), the party has generally begun to embrace nonpartisan redistricting proposals as good policy and good politics. Earlier this month, Democrats in New Jersey's Legislature attempted to change the redistricting process in ways that would have cemented the party's power, only to see grassroots Democratic activists scuttle the effort. "How can we say Republicans can't do it but we can as Democrats? Shame on us," said Marcia Marley, president of Blue Wave New Jersey and a Democratic National Committee member, during a recent rally against the redistricting effort. Both parties are gearing up for the next round of redistricting. Democrats have launched a high-profile effort: the National Democratic Redistricting Project, led by former Attorney General Eric Holder. Republicans have their National Republican Redistricting Trust. Outside groups, such as Democratic superPAC Forward Majority, are also strategically targeting statehouse races in the hopes of influencing the next set of political boundaries. The 2018 election results are a powerful demonstration of why politicians want to keep control of redistricting to themselves. Following major Republican gains in the 2010 elections, GOP lawmakers around the country used their control of the redistricting process to cement statehouse and congressional majorities in states such as Michigan, North Carolina, Ohio and Wisconsin. In addition to increasing the Republican majority in the House of Representatives, GOP control in those states also led to a decisive policy shift in favor of lower taxes, deregulation, weakened labor unions and making access to abortion more difficult. Democrats' share of the midterm vote this year was at a 44-year high, but the Republican-drawn maps in those states mostly protected House Republican incumbents from defeat (two Republican U.S. House members from Michigan lost, and one extremely close race in North Carolina remains undecided pending an investigation into election fraud). Successful partisan gerrymandering rests on one major concept: distributing the votes for your political party more evenly among districts than your opponent. One way to measure how successfully a party is distributing its votes is through what political scientists and legal scholars call "wasted votes." The idea is that any vote for the winner in excess of one more than the loser got is "wasted," as would be the votes for a losing candidate of the same party in another district. This isn't, of course, to say the voters who cast them don't matter — but these votes didn't directly decide the races. As a party that is increasingly dependent on votes from urban areas, Democratic voters are often less efficiently distributed across most states than Republican voters are. Most of the votes for Democrats would be considered "wasted" by being packed into heavily Democratic districts rather than being distributed throughout the state. It's a similar story in Ohio, where Republicans statewide beat Democrats 52 percent to 48 percent, but the GOP won 10 of the state's 14 congressional districts — over 70 percent of the seats. This slow-moving political chess game will keep playing out over the next three years (and perhaps longer depending on litigation). But Levitt, the redistricting expert, believes voters are becoming increasingly savvy about the issue. "This process ... can seem like the sort of thing political scientists care about and eggheads care about but real people don't necessarily reflect on, but I think that is also changing," he says. WHYY reporter Joe Hernandez contributed reporting to this story.